Maui Weather today: don’t care what they say…it’s windy, chilly and looks like RAIN Upcountry! A very unusual summer. When I moved to Maui I had only been Upcountry once, on vacation. 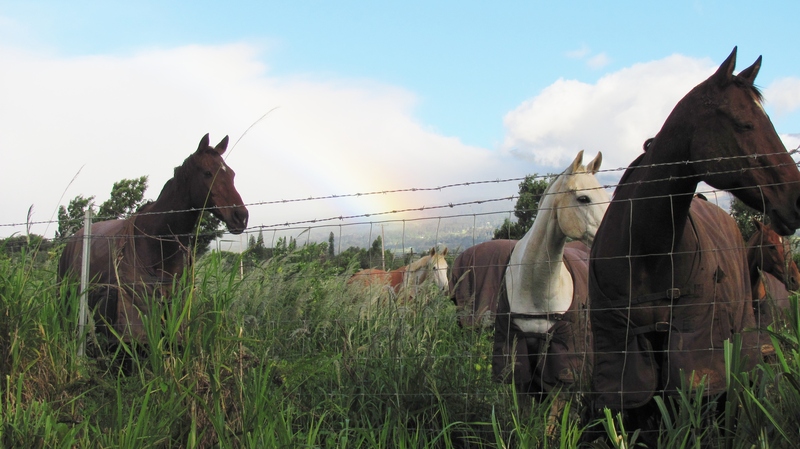 “Upcountry” refers to the area at the base of Haleakala mountain and includes the communities of Kula, Pukalani, Olinda, Makawao and Haiku, plus surrounding areas. When I vacationed here, someone told me it was where the “normal” people lived (whatever normal is!) meaning full-time Maui residents who wanted to buy a house and not live in a condo. 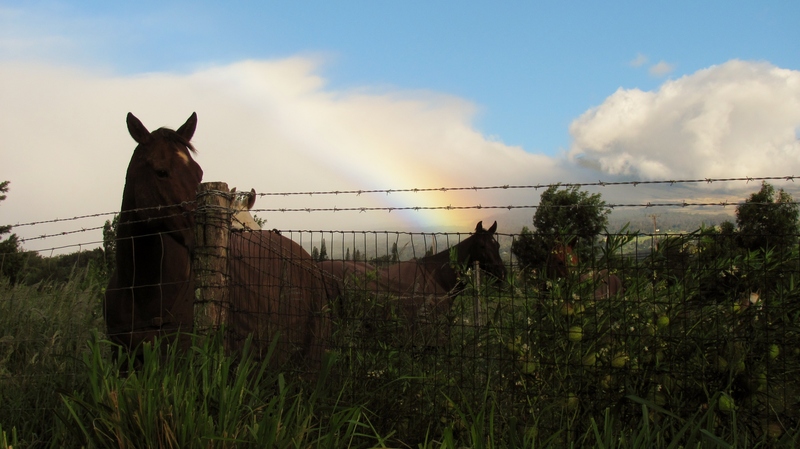 Other than that, I had no idea that there were cowboys and horses and ranches and a Polo Club http://www.mauipoloclub.com/. up here. We went one Sunday to watch Polo and it was a lot of fun. I did an informal poll at the dinner gathering Sunday night. Why do you live where you live on Maui? Our group included a guy who lives in Kihei to be near his job, but is from Madison, WI. (Shout out to my sister Marcia and her husband Richard in Madison!) He said when you’re from the Midwest, the pull to Maui is agricultural. That a Japanese farmer in Maui is no different from a strapping German farmer in Wisconsin. As I toured my friend Wendy’s property that evening I was struck again by how much Makawao looks like Indiana, where I was a kid. Horses and cows and fields. Rapsberry bushes running wild along Wendy’s fence row, just like in Michigan, where she grew up. They say you can never go home again…but do you think we try to recreate what we had as children? It that really why I live Upcountry? What about you…if you moved to Maui, where would you choose to live and why? The real question is: how would you design your life? Many who live on Maui wish they had a place at the beach for in the winter and a place Upcountry for in the summer when it’s hot. In our dreams! Example: you go to Safeway in Lahaina and the tourists, who have no idea where anything is, have their carts parked sideways, blocking the aisles. And they drive sooo slowly. Looking at the scenery, or more likely, lost. And clueless that we need to be somewhere, like now. I totally understand this, because as a tourist in Napa Valley a couple of years ago, I nonchalantly headed out from my hotel onto the old two-lane highway for breakfast one morning, and when I glanced in my rearview mirror, a local girl was making a rude gesture and pounding her fist on her watch. Then she sped around me. Stupid tourist, indeed. Yes, they have jobs and time schedules, but don’t they know I’m on vacation? On Maui, do tourists realize we have jobs, doctor’s appts and dentist appts. to get to, kids to pick up from school…just like they do back at home? Vacation is a bubble people live in for a brief moment that they wish could last and last…so they stretch it out. Slowwwllly. I find it one of the most interesting phenomenoms that people stake out their little corner of Maui and don’t leave it. You tell yourself you won’t do that when you move here…but somehow it happens. Maybe it’s the winding road into Lahaina that keeps people from going over there. And then you certainly don’t want to drink at a restaurant and then drive that road back home. Or maybe it’s that people work over there and don’t want to drive back over for entertainment? But how does that explain that Lahaina people who don’t want to leave there? Seriously. Here’s my parting story: when I began my women’s group on Maui, the group of women met for the first time. The idea was to rotate houses for the meetings. There was one girl, April, who lived in Kihei. The rest of us were Upcountry folk. When Karen heard that April was from Kihei she said heatedly, “I am NOT driving to Kihei.” This, my friends, is is a thirty-minute drive, and no one wants to do it. Don’t ask me why, I can’t explain it. I lived in the corn fields of Indiana where we drove thirty minutes for a gallon of milk. They say there are beach people and mountain people. Maybe it’s as simple as that. This entry was posted in Life in Hawaii and tagged A Maui Blog, Aston Maui Kaanapali Villas, Fairmont Kea Lani, Grand Wailea Maui, Hawaii Tourism Board, hawaii tourism Bureau, How to move to Hawaii, How to move to Maui, Just another day in paradise, Kaanapali, Lahaina, Living in maui, living in Paradise, living on Maui, Maui Blog, Maui News, Maui Polo CLub, maui Tourism, Maui Tourism Board, Maui Tourism Bureau, Maui Visitor, Maui Visitor's Bureau, Maui Weather Today, mauipoloclub.com, move to Maui, moving to Maui, nature, Paradise, tips on how to move to Maui, Tips on moving to Maui, travel, Travel and Events, Upcountry Maui, Where you stay? Your Daily Dose of Paradise by jamaicawtr. Bookmark the permalink. I discovered your blog today (August 8, 2012) and have been reading it with absolute rapt fascination. I currently live in Oregon. In 1999, after a gorgeous day spent swimming with around 300 wild dolphins and watching and listening to Hawaiian entertainers under the banyan tree in Lahaina, I decided to start checking real estate prices. As it turned out the prices were very low, so I ended up buying a little one-bedroom condo in Kihei. I chose it because it was cheap (what can I say? I’m a cheapskate! ), but also appealed to my sense of aesthetics. It has a nice layout for a tiny (560 sq ft) place, is on the second floor of a two-story building, and looks out on a well-manicured garden. The condo fees are relatively low, and the little complex boasts a pool, jacuzzi and barbeques. It’s a residential complex, so tends to be quieter than the the many “condotels” that line S. Kihei Rd. I currently have a tenant who pays about half of my mortgage payment and condo fees. The unit is close enough to the better beaches to make for an easy commute. Shopping and services are practically across the street. I believe that in September of 2013 I’ll be able to join the ranks of the mainlanders who have moved to Maui. I’ll be living off a modest government pension, some investments, and I hope to score some type of job within a year of arrival. I’m a flexible, big (6’6″! ), enthusiastic, jovial fellow, so I hope my personality and skills will help me fit in. If they ever decide to do a Gilligan’s Island re-make, I could probably play a fairly convincing Skipper. As a single fellow with few ties back “home” and a real love of the Maui weather and ocean, I think I can make a pretty good go of it. I’ve already begun thinning my posessions, determining what few things will move with me. Mahalo nui loa for this blog! It’s one of the best I’ve seen on daily life on the island. I am so glad you’re enjoying the blog! Thank you for taking the time to share your thoughts. It’s comments like yours that keep me writing. Congratulations on taking the steps to realize your dream to move to Maui next year. Can you please tell me how you found the blog? I am always curious how people come to it. MAHALO NUI LOA for writing, and I will strive to keep the blog top-notch. I found your blog by doing a Google search with keywords “blog move to maui.” Your blog wasn’t the first item that came up but it has certainly been the most enjoyable. Thank you for talking story about the reality of life on Maui. I’ve been coming over several times a year since the mid 1990’s so I’m becoming pretty familiar with the place, In fact, it feels like home. I actually experience a strong sadness when leaving and an almost overwhelming sense of longing while away. I’ve already experienced a lot of the frustration and cost of living on Maui, so I think I have a fairly realistic idea of what I’m in for. Your writing has really driven the factors involved in daily life home, however, and I really appreciate the generosity you’ve displayed in sharing your life experiences. I hope you’re able to keep the blog up despite your tennis elbow. I wish you all the best and will remain a loyal follower..
That same strong sense of sadness when leaving and almost overwhelming sense of longing while away is what brought me back to Maui again and again before I made the move…so I understand totally. As far as driving home the factors involved in daily life, I felt there was a lot of fluff out there that painted Maui as a perfect paradise. People write to me all the time now with questions about moving to Maui, and I just try to keep it real. Thanks for becoming a loyal follower!